FROM THE #1 BESTSELLING CREATOR OF OTIS AND THE ILLUSTRATOR OF THE LITTLE ENGINE THAT COULDOn the farm where Otis the tractor lives, the farmer has introduced someone new - a scarecrow to shoo away the pesky crows. But when Otis and the animals greet the scarecrow with friendly smiles, the scarecrow's frown never leaves his face. So everyone leaves him alone.Then one day, when a cold autumn rain sets in, Otis and the animals snuggle close and play Otis's favorite game: the quiet game. Otis knows the puppy and ducks can't sit still for long, and soon the farm friends begin to giggle and squirm, feeling warmed by one another's friendship . . . but on this day, Otis can't seem to take his eyes off the lonely figure in the cornfield.A deeply resonant book about subtle acts of compassion and standing up for others, featuring everyone's favorite tractor, Otis. I have always been a huge fan of the the American School painters of the 1920s and '30s and I was particularly inspired by Thomas Hart Benton and Grant Wood. I am also drawn to the Works Progress Administration (WPA) muralists. Many of these artists were from the Midwest, like me, and I felt a connection to them. They were storytellers. That's what I like to do - tell stories. When I plan out the illustrations for a book, I pretend I'm making a movie. The words are like a screenplay and I'm choosing which scenes to bring to life. Before THE LITTLE ENGINE THAT COULD I never viewed myself as someone who would paint trains with eyeballs and cute little purple elephants. 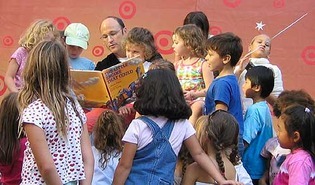 I began realizing who my audience is: little children who would actually be holding one of my books. I thought hard about the books I loved from my own childhood. THE LITTLE ENGINE THAT COULD was always one of my favorites, as was THE POKY LITTLE PUPPY, THE STORY OF FERDINAND and Virginia Lee Burton's books. I began thinking about creating books that, like these, might someday become a child's favorite. This is where the idea for OTIS started. I approach both writing and illustrating enthusiastically. If I'm going to illustrate a manuscript that someone else has written, it's got to be something that I love. I have to love a story enough to do it and make it mine. I hope that doesn't sound overly egotistical. But I feel that the book becomes as much mine as the author's, and as much the author's as mine. For about a dozen years after getting out of school, I did illustrations for greeting cards, theater posters and magazines. But you never meet your audience when you do a picture for a magazine and it's not really the product - you're just decorating the product. In book publishing, on the other hand, the book is the product. After illustrating my first book, I knew I loved children's publishing right away. I discovered that people cared - teachers, librarians, booksellers and kids. And I got to meet my audience. I'm honored that several books that I've illustrated have received awards. Angela Johnson's I DREAM OF TRAINS won the Society of Childrens' Book Writers and Illustrators' Golden Kite Award for picture book illustration. TOY BOAT by Randall DeSeve was awarded the 2007 Publisher's Weekly Cuffie Award for Favorite Picture Book of the Year and the 2008 Great Lakes Book Award for Children's Picture Book. Walt Whitman's WHEN I HEARD THE LEARN'D ASTRONOMER was a Golden Kite Honor Book and also won the 2004 Parents' Choice Gold Award. I've also received two gold medals from the Society of Illustrators.